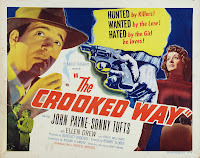 THE CROOKED WAY is a film noir starring John Payne as an amnesiac caught up in a waking nightmare. Whatever the film may lack in terms of the script is more than compensated for by its fantastic style. Payne plays Eddie Rice, a long-term patient at a San Francisco military hospital. Eddie has complete amnesia due to shrapnel embedded in his brain, and all the army's been able to find out is that he originally enlisted in Los Angeles. Eddie heads for L.A. immediately upon his discharge from the hospital, and he's picked up by the police almost the minute he gets off the train at Union Station. Eddie also attracts the attention of Nina (Ellen Drew), who alerts Vince (Sonny Tufts) that Eddie's back in town. Amazing how Eddie is immediately recognized by multiple people in such a big city! The film starts out with a very intriguing premise but I ultimately found the story only so-so. Despite a couple unexpected moments, the script gets a bit draggy in the second half. 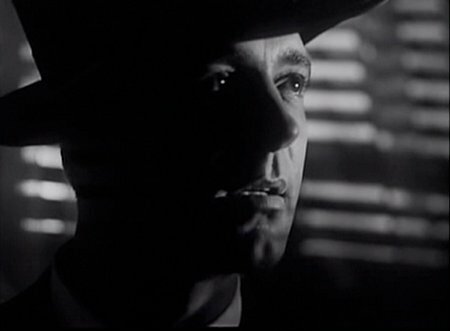 It's also quite brutal, even for a film noir, with a character thrown down a fire escape plus a shocking murder halfway into the film. I think the film suffers from the loss of the murdered character. The plot is rather reminiscent of SOMEWHERE IN THE NIGHT (1946), another film about an amnesiac veteran with a dark past. SOMEWHERE IN THE NIGHT was a bit meandering itself, but I think it had more engaging characters. 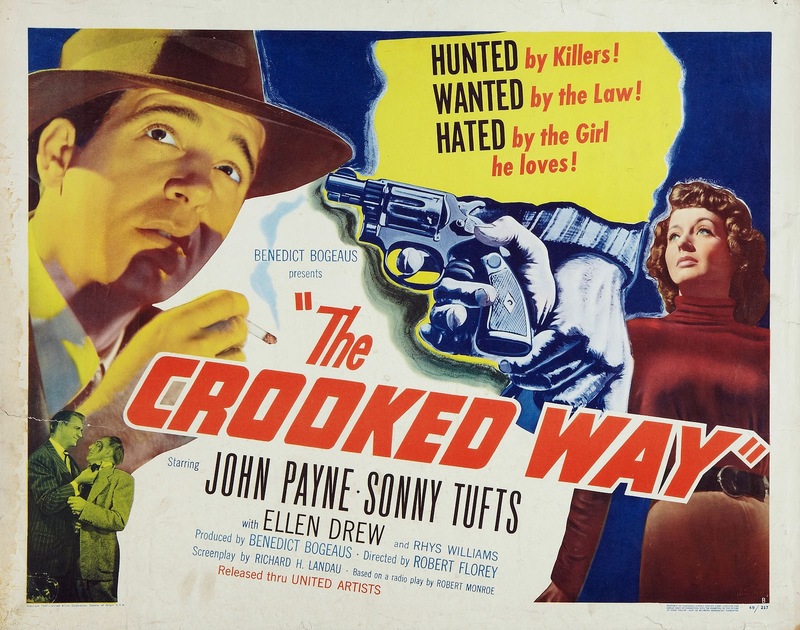 That said, THE CROOKED WAY is must-see noir because of its incredible visual style. 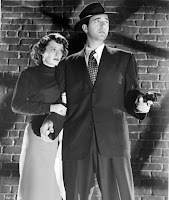 The movie was filmed by the great John Alton, whose black and white noir masterpieces included REIGN OF TERROR (1949) and THE BIG COMBO (1955). Alton's work on THE CROOKED WAY is truly stunning, filled with fascinating shadows and silhouettes; for instance, take a good look at an early scene with Ellen Drew in a bail bondsman's office, with his window advertising reflected on the wall. Odd-angled shots, dark mean streets, men in fedoras, whispered conversations in silhouette, it's all here, and it looks great. Alton, incidentally, was equally good with color work; he later shot Payne in the "Technicolor noir" SLIGHTLY SCARLET (1956), and he won the Oscar for shooting AN AMERICAN IN PARIS (1951). The movie was filmed in interesting locations around Los Angeles; I'd love to know where some of the scenes were shot. The combination of the black and white cinematography and the locations give the movie a distinctive look which makes it visually fascinating. I also enjoyed the film's brief glimpses into police science of its day. And check out Drew and Tufts' teeny-tiny TV screens! Payne had a rich career in the '40s, starring opposite all Fox's great musical stars and appearing with Maureen O'Hara in the classics SENTIMENTAL JOURNEY (1946) and MIRACLE ON 34TH STREET (1947). Like another crooner before him, Payne then completely switched gears; he starred in his first film noir, LARCENY (1948), the year previous to THE CROOKED WAY. 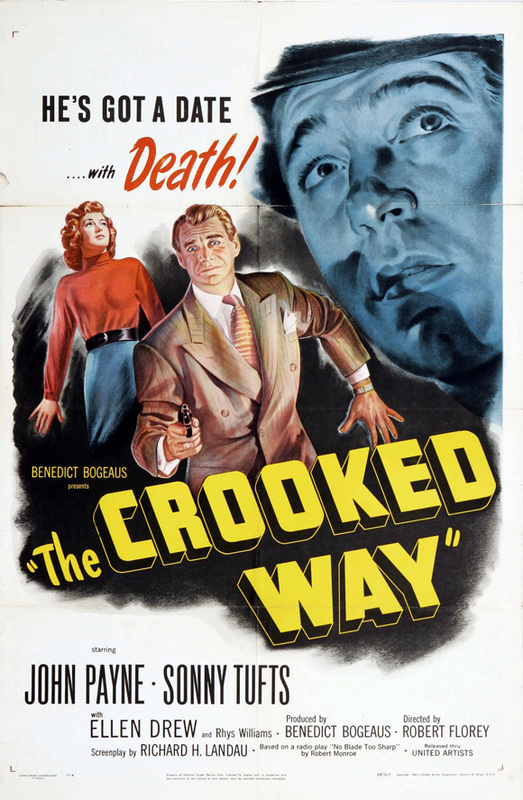 THE CROOKED WAY would be followed by more noir titles such as KANSAS CITY CONFIDENTIAL (1952) and 99 RIVER STREET (1953); simultaneously he made adventure films and good Westerns such as RAILS INTO LARAMIE (1954) and SILVER LODE (1954). Payne's quiet, laconic style is well suited to playing a man who spends a great deal of time listening and trying to gauge other people and where they fit in his life -- although Eddie is so stoic, somehow managing to keep going despite beatings, betrayals, and frame-ups, that at times I would have liked to see some deeper flashes of emotion. Ellen Drew (JOHNNY O'CLOCK) plays a woman from Eddie's past who's gradually won over by the "new" Eddie. Sonny Tufts, last seen in the excellent EASY LIVING (1949), plays the malevolent villain. Rhys Williams give the film extra energy in his scenes as Police Lt. Williams. The cast also includes Charles Evans and John Doucette. Look for Frank Cady in a small but entertaining role as a barfly who's not quite who he seems to be. 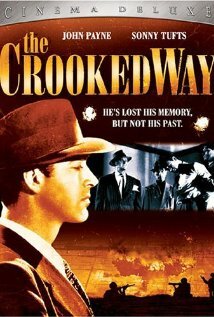 THE CROOKED WAY was directed by Robert Florey. It runs 90 minutes. This United Artists film has also been shown on Turner Classic Movies. February 2019 Update: I had the wonderful opportunity to see this film in 35mm at the UCLA Festival of Preservation. I have seen this film and wished I liked it. Beautiful from a film craft point of view. Ellen Drew a favorite. Payne and Tufts fine. An unfortunate miscalculation in the story department. It's essentially the same story as Somewhere in the Night but I prefer this version - pared down and grittier. Both "amnesia" films have much to recommend them, though neither title is perfect. As Barrylane notes, THE CROOKED WAY is sure beautiful to look at. First, thanks for the link, Laura. And I'd totally forgotten I'd left a comment here when you originally wrote about this film. I guess I like the movie a bit more than you do despite certain weaknesses in the script which definitely exist. It's one of those that has grown on me more as I enjoyed my recent rewatch quite a lot.